30 May 2012. The bidet confuses many Americans. We have two in the apartment: one in each bath. Here’s a demonstration of one possible technique. Laurel, this is just ONE of the million reasons I adore you! Your amazing sense of humor and ability to catch the irony in every situation! Needless to say I am enjoying ALL your posts! LibbyJean got me moving to respond! Pretty girl! Smart girl! In a small apartment, everything should be multi- functional! All is well in Portland. Not as exciting at all as reading about your settling in. Neighborhood looks wonderful. Starbucks sure isn’t Parco della Musica! Have your tickets for Pink Martini? You should email them and tell them you are there. Bet you would get some nice attention! Bet Krista could get to them if you can’t. My excitement includes my Saturdays working at the Cedar Mill Farmers Market. I’m selling upcycled feedbag totes for a horse/donkey rescue sanctuary out in Sandy. It is really fun being a vendor at a farmers market – very interesting and fun people to talk with. Also enjoying Mondays working at the Vet Hospital. Good Zoo environment. Ha!Ha! That is a good one!!! That is hysterical, Laurel! 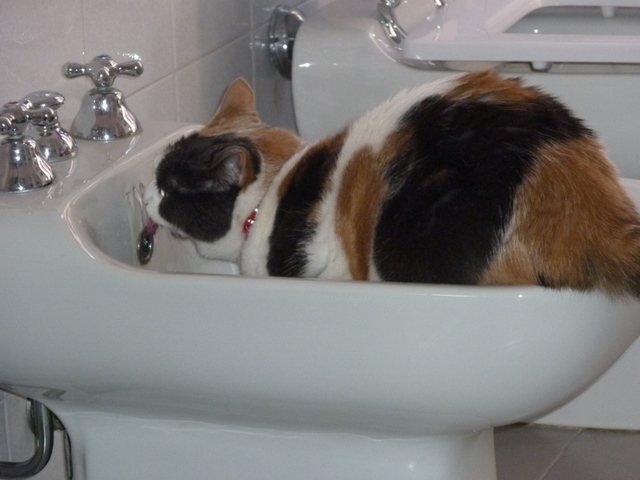 I always knew cats loved “fresh” water but this….